A few weeks ago I observed something curious in one of the personality type groups I frequent on Facebook. One member started a discussion about what kind of villain different personality types would be and there were a few types they didn’t even list. Their assumption was that most Feeling types wouldn’t become villains and especially not NF or FP types. Rather than bask in the knowledge that we’re the lest villainous type a surprisingly high number of NFs jumped into the comments to defend our ability to turn evil. Most of their comments went something like this: “Well, I wouldn’t personally be a villain, but I could be because *insert reasons. * And on top of that, *insert fictional or real name* is a villain of my type.” I laughed at the number of INFJs who reminded people that Hitler was an INFJ while at the same time reassuring people they don’t feel Hitler-ish tendencies themselves. Who Gets To Be The Villain? I dare say when most people think about villains, they think of a detached mastermind. There’s a ridiculously high percentage of NT type villains (and correspondingly few NT heroes; it’s even harder to find heroic INTJs in fiction than it is to find NF villains). In real life, of course, people of any personality type can lean more towards the best version or the worst version of their type. No one personality type is inherently “better” than any other. However, society does stereotype certain characteristics associated with types as better or worse. Prioritizing other’s safety over your own, a characteristic most commonly associated with FJ types, is often seen as a heroic trait. Hence, we see characters like Captain America with an ISFJ personality type. But what if you have an ISFJ character who decides only a certain group of people (or even just one person) is more valuable and it’s their duty to protect them? Suddenly the heroic trait doesn’t seem so safe any more. Especially when you consider the prime example of a villainous ISFJ is Norman Bates from Psycho. On the other hand, being able to look dispassionately on a situation and make tough calls doesn’t necessarily make you a bad guy, but it’s not a trait most of us would call heroic. So we see TJ types accused of being cold and unfeeling and they end up as evil dictators or masterminds. Or both, like INTJ Emperor Palpatine. But sometimes you can’t save everyone and someone has to make the tough calls. What sort of hero steps up then? It’s often a Thinking type like ESTJ Princess Leia. Good and evil isn’t all that cut-and-dry, even in fiction. NF types are called the Idealists. As a group, they’re usually described as types who have a grand vision to make the world a better place and help as many people as they possibly can. It’s not easy to understand the motivation for a type like that turning to villainy. As one writer says, “When your mind is naturally set to do the best you can for humanity, it seems they’re the least likely to go that path of destruction and chaos” (click here to read article NF “Villains and Other Miscreants”). The first definition that comes up for “idealist” when you type it into Google is “a person who is guided more by ideals than by practical considerations.” When a type like this goes evil, they’re among the hardest villains to understand or to stop. They believe they’re right and if you oppose them you don’t deserve any of the kindness and consideration that healthy NF types bring to relationships. 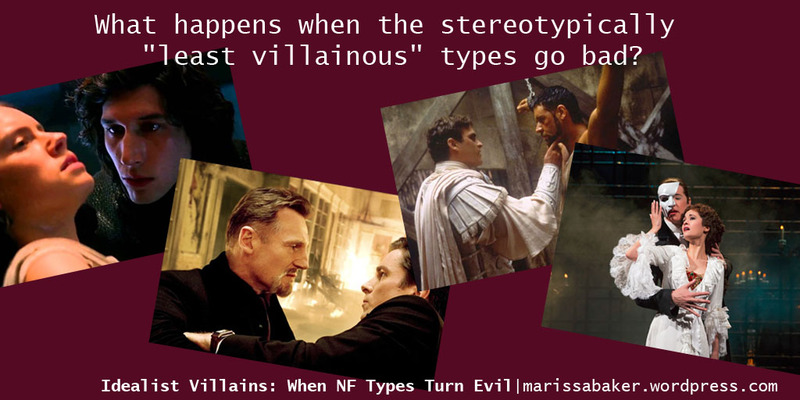 I’d say an evil NF type most likely goes one of two directions. 1) they truly believe that their evil plot is the only way to bring about the best outcome for humanity (take Ra’s Al Ghul from Batman as an example). Or, 2) they’re in such a twisted, unhealthy state they really don’t care about others anymore (like Smeagol/Gollum from Lord of the Rings). Both those versions can take different forms, but that seems like the most basic categories. The one that thinks they’re actually the hero and the one who doesn’t care about being a hero anymore. Writing an NF villain can be a risky choice. Just look at the mixed reaction to Kylo Ren after Star Wars: The Force Awakens came out. People either thought (like me) that it was fantastic to see a different type of villain, or they called him as a whiny crybaby and refused to take him seriously. I suppose that’s one reason there aren’t very many of them. But it’s also the reason they make for an interesting story-telling choice. Here’s a list of fictional villains who I’ve seen typed as NF personalities. Some of these are my personal typings and others are typed by random people on the internet. I’ve even included a few characters that I’m not personally all that familiar with, but other people seem to agree they’re NF types. As always, typing fictional characters is a highly subjective endeavor so feel free to disagree in the comments. 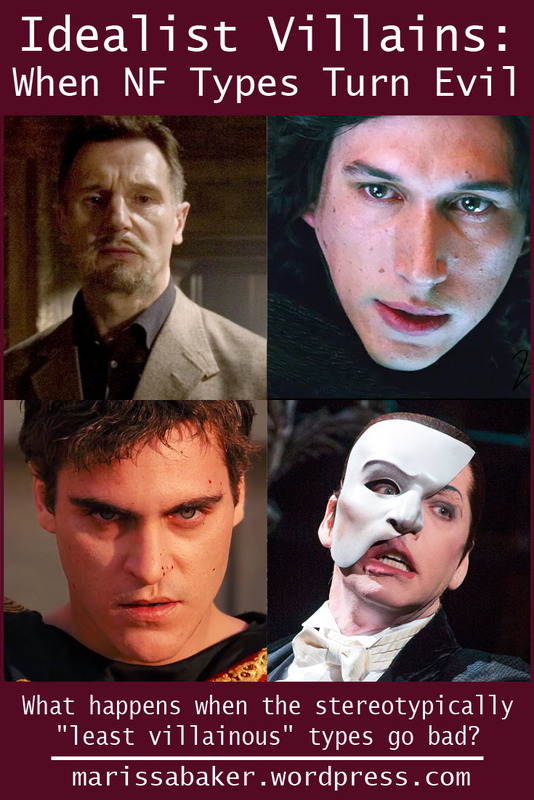 Also, please suggest others characters you think might be NF villains! Thanks for sharing! I personally think NFs make some of the most compelling villains. Their deep feelings make them unswervingly loyal to their evil cause and their understanding of people can make them the most manipulative of characters. Hands down, John Doe(Kevin Spacey) from Se7en. INFJ extreme to the polar end. His plan to motivate people by showing them the error of their ways through using people as subjective tools and metaphorical symbols via the Seven Deadly Sins is pretty on point…especially listening to him in the end during his explanation and the ‘why’. His abode denotes his deep connection to God, yet, his views are of a darker sort which would turn most away just on their ‘feeling’ alone to believe that subjective God would ‘never’ be behind such atrocious acts. David Mills character is the ‘hero’ type – and the primary extravert in the film. At least to me, and I’ve watched this movie an insanely huge number of times before I even got deep into personality typing and Jungian Philosophy in the first place. I’m not sure what I would type him as in full, as I’m not as privy to bothering with many other types but I still remain convinced that he is of the extraverted tree. Hannibal Lechter is another. From the books and Silence of the Lambs film, I’m speaking of predominantly. The TV show did a good number as well (and Will Graham himself is an overly feeling type to be sure), but since we are speaking of Villains…well, had to bring him up. He can easily seem like an extrovert, but it’s obvious his preferences are to his lonesome in a sense. Save for those he ‘let’s in’ or, are not ‘prey’. He is, in my mind, another that would be a ‘sinister’ version of an INFJ using their ‘abilities’ and functional stacks to manipulate situations to their advantage. No matter how ‘feeling’ one may be, if one is focused more on the darker side of the ‘human’ thought processing – nothing can really sway them from their vision or how they view humanity in general. I mean, Lechter was a Psychologist and did help people better themselves. And in that, he was helping humanity, albeit a small portion of it. The fact he was a killer on the other hand just goes to show it doesn’t take much to voluntarily become a Monster when you are that privy to the Inner Worlds of the Unconscious – that place most INFJs prefer to be in. The choice was made on their own volition. In truth, it is society that perceived it as evil – however in John Doe’s case…his point was very poignant with an extreme variable used to gauge people’s thoughts. I can agree, as most people are far too subjective to discern an act on their personal feelings and using the worst society has to offer to prove a point engages multiple forms of thought in said ‘sheeple’. But i’m an awfully weird INFJ myself so, it’s probably why I discern a lot of this as not as disturbing since on one hand, like with Doe, I agree with him. When the world is ripe with apathy to an extreme and most only bother acting on their ‘feelings’ instead of anything remotely logical (I’m sure I seem more INTJ mentioning logic…but I am a Feeler – I just am very aware of my Ti after my initial response to a situation with Fe and quickly think if through BOTH sides), you bring in a dastardy amount of weakness ripe to be taken advantage of. But that is just my two cents to two highly ‘feeler’ type ‘villains’. I haven’t seen Se7en or read/seen any of the Hannibal Lechter stories, but from what you say it does sound like they’re doing some interesting things with NF villains. And I’m pretty sure I’ve heard others talk about Kevin Spacey’s character as being an INFJ. Thanks so much for commenting! Glad you like the post! I also find Loki a very sympathetic character. I can’t see myself ever turning against people that completely, but I empathize with his loneliness, frustration, and desperate hunger to be valued for who he is rather than what his family wanted him to be. Sorry I was super excited to see my article linked somewhere, and glad to see you agree with my assessment of the oft overlooked ENFP villain!